“Modi’s chief economic adviser Arvind Subramanian had opposed India on IPR till recently,” Swamy tweeted. The Bharatiya Janata Party on Wednesday distanced itself from BJP leader and Rajya Sabha MP Subramanian Swamy’s remarks against Chief Economic Advisor Arvind Subramanian demanding his sacking. 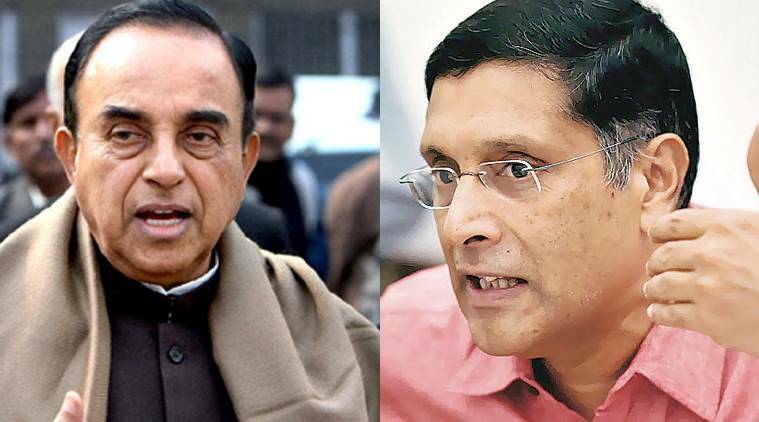 “BJP does not agree with Subramanian Swamy’s views on govt’s Chief Economic Adviser Arvind Subramanian. This is his personal opinion,” said BJP in a statement. The party’s response comes hours after Swamy’s tweets early Wednesday morning when he said it was time for the government to sack the CEA claiming he wasn’t in agreement with the BJP government’s policies including, most recently, its IPR policy. “Modi’s chief economic adviser Arvind Subramanian had opposed India on IPR till recently,” Swamy had tweeted. Arvind Subramanian was appointed economic advisor to the Government of India in October 2014, succeeding RBI Governor Raghuram Rajan. Last week, Swamy led an unrelenting attack on RBI Governor Raghuram Rajan and claimed success in ensuring he doesn’t get a second term in office. Even before Prime Minister Narendra Modi swept to power in 2014, Swamy was agitating for Rajan’s removal. On Saturday, Rajan, in a letter addressed to his colleagues, announced his decision to not run for a second term as chief of the central bank.